Luxury Cars and Watches - Boxfox1: The height of design and technology. The BMW Mountainbike All Mountain. The height of design and technology. The BMW Mountainbike All Mountain. 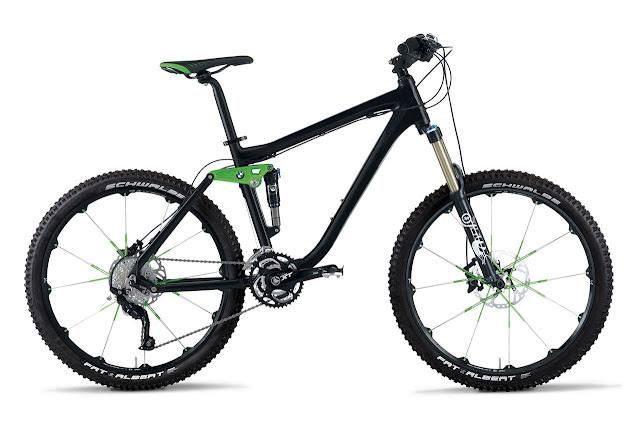 The 2013 BMW Mountainbike All Mountain guarantees a top-quality performance for freeriders, trail enthusiasts, mountain bikers and relaxed cruisers alike. The bike is the result of a collaboration between BMW engineers and a German mountain bike specialist, and will be presented for the first time in the sports collection of the BMW 2013/2014 lifestyle catalogue. Like all BMW bicycles, it combines a striking appearance with sophisticated technology. The BMW Mountainbike All Mountain has a perfectly tuned chassis and a full-suspension, hydro-formed and powder-coated aluminium frame. Its special design is the result of a production process that is otherwise only used in car manufacturing.With 30 gears and a lock-out fork, the Shimano XT derailleur makes steep uphill cycling easy. The four-pivot rear with anti-bobbing technology ensures optimal power transmission, and on the downhill journey riders can rely on the hydraulic disc brakes for extra safety. The bike’s extremely comfortable suspension and sensitive steering mean it is also perfect for the bike park. Its 13.4 kg and reliable Shimano XT technology make the bike the ideal choice for almost any kind of terrain. The bike is painted in matt black, with bright green accents on the fi’zi:k saddle, Crank Brothers wheel set and rocker. For those who prefer slightly less mountainous routes, the BMW Cruise Bike 2013 and Touring Bike 2013 are good alternatives, and the BMW M Bike Carbon Racer is perfect for road racers.